Heat oven to 375 F. In a large skillet, add oil and heat over medium-high heat. Add onion and bell pepper; cook until they are well cooked and softened, about 10 minutes. Add garlic and cook one more minute. Season with salt and pepper. Remove veggies from pan. Add thinly sliced steak to the same pan over medium-high heat and cook until no longer pink. Add beef broth and Worcestershire; cook another 8-10 minutes, until the broth has reduced. Meanwhile, make the butter topping by combining melted butter, Dijon, garlic powder, minced onion and salt. Place bottom of the slider buns in a 9x13 pan. 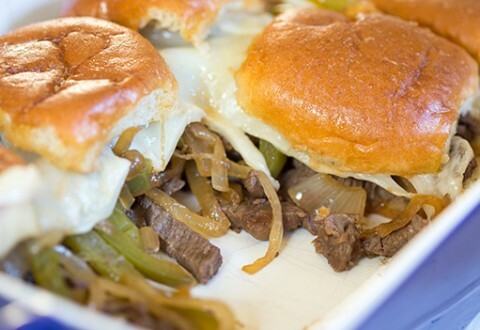 Distribute beef among the buns; top with veggies. Top veggies with cheese and bun tops. Brush thoroughly with butter topping. Cover with foil and bake for 12-15 minutes, until cheese is melted. Serve and enjoy!